Lucas Grogan is our third, and final, artist in residence for 2017. 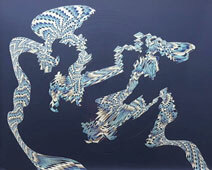 He has just had a sell out exhibition at the highly successful Sydney Contemporary art fair, and this is his first solo exhibition in Western Australia. 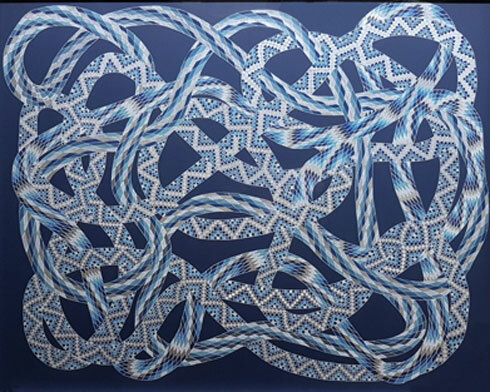 He is best known for his signature blue and white artworks that span a variety of disciplines including hand stitched quilts, murals and gallery paintings. They all have fastidious patterning, and vary from figurative, to text based, to abstract forms, many infused with a sly sense of humour that pokes fun at himself and the art world. Whilst Grogan does not take himself or the art world too seriously, (probably as a result of working in various galleries) he does work terrifically hard on his projects, often labouring seven days a week. He also enjoys commissions and collaborations, including an album cover for Marcus Marr & Chet Faker, matching beach umbrella, rug and cushions for Basil Bangs, scarves for Skarfe, a clock for Hunting for George, porcelain plates for Faux and toilet tissue and tea towel for Third Drawer Down. This exhibition of new work in Perth will feature paintings, and an immersive wall installation that has to be seen to be believed! 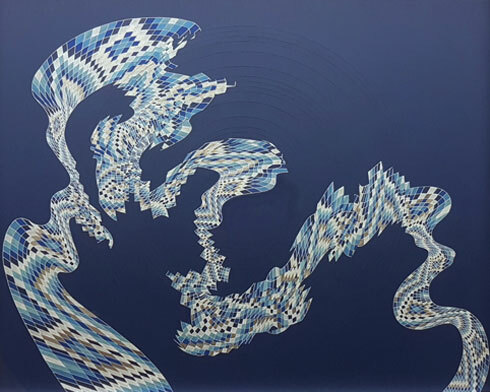 His highly detailed abstract patterns intersect and weave together referencing architectural spaces and natural forms like the spreading ripples on a pond, or rainbow arcs. These patterns interplay hypnotically against each other, expanding and contracting in strange micro - macro worlds. 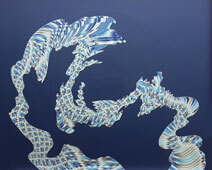 A number of these new works have been painted using YInMnBlue, accidentally discovered by scientists in 2009 at the Oregon State University. This particularly vibrant blue was released in 2016 as an experimental colour, named Oregon Blue, in artist acrylics by Derivan. (Still undergoing development before commercial release). Its intensity is perfect for Grogan's work and will no doubt make his work even more highly sought after. His artworks have been acquired by some impressive collections, including the National Gallery of Australia, Duetsche Bank, Wesfarmers, Ararat Art Gallery, Newcastle Art Gallery and numerous private collectors.